Congratulations guys! I started following the project when the funding was at a snails pace, so seeing it up to this point is really crazy, exciting and fantastic!. As a single developer, I could use your advice and help with building up an audience for my upcoming campaign. Good job guys! I'm so glad we made it as far as we did! Here's hoping we AT LEAST make it to the Additional Characters tier via PayPal! 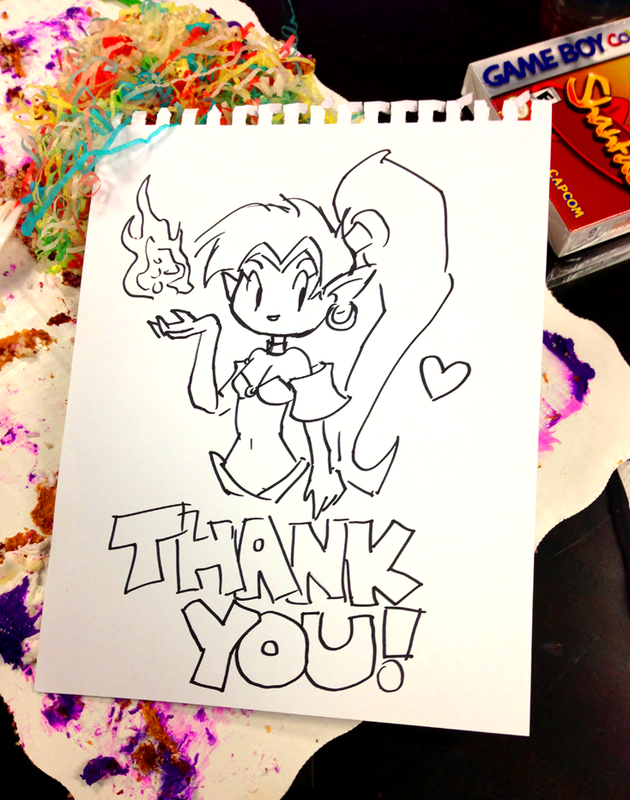 THANK YOU SO MUCH WAYFORWARD! You made this such a great experience for me and I cannot WAIT to get my hands on this game! On the Wayforward site: can you guys please replace the Kickstarter countdown clock with, let's say, a meter showing how far away we are from remaining goals? Congratulations and now you know what to do next. We are all waiting and trust you that the result will be awesome! @Benjamin: Did you not read the update. PAYPAL WILL REMAIN OPEN! We can still make the funding for the remaining content. I'm so Glad i donated 25. Will the remaining limited items be moved to the Pay pal page? This was a wonderful campaign. Congrats on how successful this was. Hero Mode should be all but in the bag with PayPal remaining open. Good luck with development and I can't wait to play both Pirates Curse and HGH when they come out! Also, I would hope that eventually, some of the stuff that wasn't initially funded(Such as Hero Mode, the rest of the Bonus Chapters, and the ability to play as Sky, Bolo, and Rottytops) will become available as DLC. Huzzah! Congrats on the success! Although, it might help to say how long Paypal will be open for. As well as where to watch for regular updates on the total. So freaking stoked for this! And I'm pretty sure Hero mode is going to happen eventually. And thanks to all who spread the word to make the stretch goals a reality let's keep it up! The link url to wayforward.com is misspelled. While the page text is correct, the url actually links to "wayforwrd"
Well done all! Proud to be a backer on this game! Whoohoo! I wish I hade more than $19 in my account to give you. Would you please post an update that tells pledgers more about what you have planned for Hero mode and our three possible playable characters? I am certain that knowing more about what we could recieve would quickly entice people to pledge more money to make it a reality. I'm really impressed with the final total. I'm actually quite optimistic that the Hero Modes will be funded with about $87,000 needed for it to happen. After that, I want the Clockwork chapter, but that one is a ways off. Either way, good job everyone! How long is the pay pal account open for? Because, I'm broke right now but in January I'll get some cash and I want to pick up another copy of the game for a different platform. Ive been waiting to play this all day http://www.youtube.com/watch… I am very proud of all of us and hopefully everyine else here is too. We need $88,038 in order for us to reach $900K. You're welcome for all the help and thank you for being an amazingly awesome game company. I'm proud to pledge $200 to you. NOW LET'S GET THOSE STRETCH GOALS A REALITY!!! I hope we can get at least to the Voice Acting stretch goal. I <3 having the characters actually talk in my games. Unfortunately I have already backed to the maximum extent I can, but if the PayPal option continues long enough, I might be able to pitch in again once my finances are restored. Is that "Capcom" I see in that box? This really just ain't their year. I know I said this alot but, if almost every backer up's their pledge via paypal by $6, We'll reach the next stretch goal.. and if every backer did $30 we would even reach the last goal. Great! Nice to see it was such a success. As for the 900K stretch goal. Getting Paypal pledges will go in a slower pace compared to the kickstarter ,but we have several months. We can reach that. Yes! I can not wait to play this on my Wii U! Oh, please give the Miiverse community a creative name. Have a great day and future now.This is now Day 1. How long will the PayPal be open? If I come across some money during that time, I'd gladly pay $35 for DAT ART BOOK. Thankyou for entertaining me with the stream all day. Congrats WayForward. You're company is a valued gem in the gaming community. Let this funded project be evidence of that! Great work, but we ain't done. By a long shot. Very glad this got funded. With some luck, the stretch goals will be met too over time via donations. Would love to see fully animated cut-scenes as well as all the extra content that could be added to the final game. When can we see the game? Hooray! Way to go everyone!